It’s not that expensive to visit Nepal. If however you need to buy gear for a trek, and then go with a larger company on a trek, then Nepal costs a bit more. Here’s our wrap up of costs in Nepal. We arrived at Kakarvitta in Nepal, overland from Darjeeling, India on 26 March. After obtaining a 30 day visa for US$40, we then took a 17 hour bus to Kathmandu. We spent until April 1st chilling out and buying gear to go on a trek. When we arrived in Nepal our average daily costs were US$57.81 per person, after 11 months on the road. Our costs for Russia, China, Korea, Japan, Vietnam are detailed in individual articles. Eighteen of our 28 days in Nepal were spent trekking – in the mountains, to Everest Base Camp and back. The rest of our time was on a bus, or in Kathmandu, either chilling out, or waiting for our outbound flight back to India. Most of our costs, therefore are related to trekking. 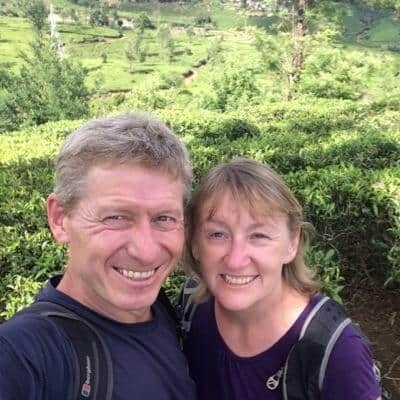 We insured ourselves through WorldNomads – as we were aware that we’d need to renew our policy while on the road, and that specifically for trekking here in Nepal, but also for some of the volcano hikes in Asia we’d need altitude coverage. We spent US$260 on gear that we needed for the trek – including boots, day packs and thermals. We paid US$2608.89 each to World Expeditions for our 18 day trek. This also included a sightseeing tour of Kathmandu and three nights accommodation at the Radisson Hotel in Kathmandu. 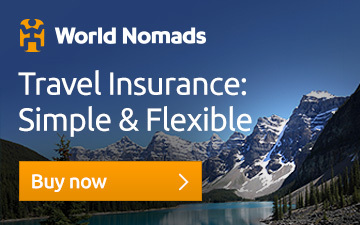 Our annual travel insurance with World Nomads covered us trekking to 6,000 meters. It gave us peace of mind that if we needed help, it would be there waiting for us. Taking trekking out of the equation we had a free night at the Hyatt before we flew out. It was one of the last of our awards nights left. So we spent an average of US$15 a night on accommodation. We stayed at the Hotel Florid in Thamel – with an en-suite bathroom and free wifi. The remainder of our costs in Nepal were for transport (overnight bus from Kakarvitta to Kathmandu), food and a few Everest beers. Our average daily cost in Nepal was US$119.38 including trekking. The trek to Everest Base Camp over 18 days was an incredible experience that blew the budget, but that we wouldn’t change for the world. On leaving Nepal, our average daily cost had gone up to US$62.73. We loved our time in Nepal. The country is generally beautiful, the people are friendly and it’s cost effective. It is a most spiritual country. If you’re looking for a place to chill out, relax and take a retreat, I can think of nowhere better. Check our how you can take a Yoga Retreat with SeeHerTravel. We left Nepal on April 24th, before the first earthquake and headed back to India. We took a flight to Delhi, then Mumbai and Aurangabad, where we wanted to see the caves of Ajanta and Ellora as well as check out some Indian Wines in Nashik. And so we’d continue our experiences in Incredible India.